In this edition of the JRC Capital Management Weekly Outlook we take a view on the currency pair EURGBP. The Brexit remains one of the dominating topics on the financial markets. Particularly for EURGBP investors it is the main uncertainty factor. Prime Minister Theresa May had to face some problems in the parliament lately. Even though the cabinet approved her draft agreement, the situation will not get any easier. Especially not after the resignation of the Brexit Minister Dominic Raab and some other Ministers. In a press conference, Mario Draghi emphasized that if inflation remains low, the ECB has to postpone any increase in the interest rates. The ECB’s QE will run out in December – there will not be an extension and market expected an increase in interest rates after summer 2019, this might not be the case anymore. There are only a few economic data scheduled for the coming week. Thus, it is more important to keep an eye on the news regarding the Brexit and Theresa May. On Wednesday, the OECD will publish its economic outlook on the Euro-zone. Also important – the German gross domestic product and some economic sentiments for the Euro-zone, which will be published on Friday. On the long run, the EURGBP stagnates in a sideway phase between 0.8700 and 0.9000, which was not violated except for a few times. On the short run, we can observe a classic down trend with constant lower lows and high. After a short break down from the aforementioned range, the EURGBP was able to recover and rise above 0.8800. Currently, the price is at 0.8870 close to the upward trend line. 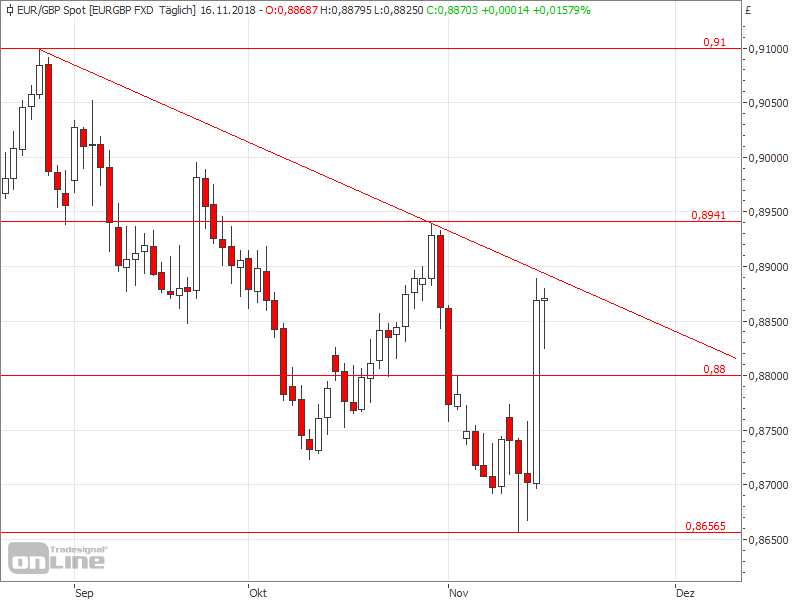 If the EURGBP bounces from this trend line and continues its downward trend, we can find the first support at 0.8800. Another support is located at 0.8656, the low of the previous down move. In combination with the lower range of the sideway trend at 0.8700 this could be a strong support area. If the price rises above the trend line, the first resistance is situated at the high of the previous recovery, at 0.8941. Prices above this level would break the downward trend from a technical point. The long-term target for the bull is to rise above 0.9100, the high of the year.